The Whittlesey House Preservation Foundation is a separate non-profit, dedicated to restoring our historic house. Over the years there have been many benefactors who have made significant contributions to our community by donating their money, their professional expertise, their time, and construction materials in order to maintain and repair our clubhouse. 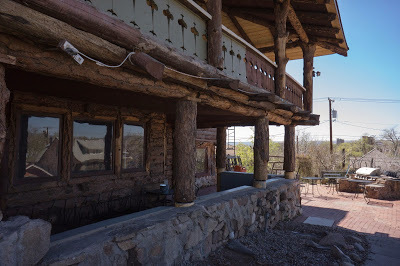 As part of the "Re-Roof project we removed the walls that enclosed the former office, restoring the condition to original "porch" space. In doing so we realized that the foundations supporting this area had failed. The NW corner had dropped approximately 9" with other posts having dropped also, though less. This is a significant problem, one that needs immediate attention, a problem we were not intending to deal with at this time. We have installed the temporary supports needed to lift the porch and porch roof back into position. By spacing the temporary jacking posts away from the existing wall, access well be available. 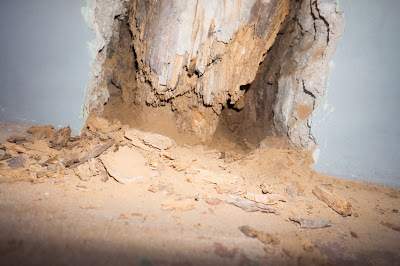 The problem: The log posts are embedded in a stone wall, probably set on earth. We believe the structures of these posts have deteriorated to the point that they have failed, slowly dropping the loads imposed from above. 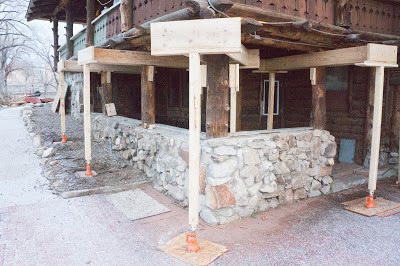 The solution: Part 1: Slowly raise the porch back into position with the foundation jacks. 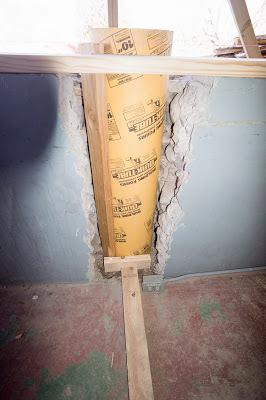 Part 2: Remove portions of the wall, construct proper footing pads then concrete columns that will extend to above the top of the wall. 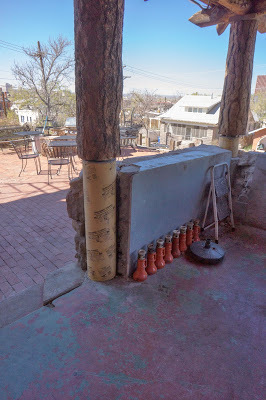 Part 3: Install new log posts that look like the originals, to sit atop the new concrete columns hidden in the reconstructed wall. This is why the porch was sinking. The posts were set on earth, not concrete, then embedded in the stone wall. 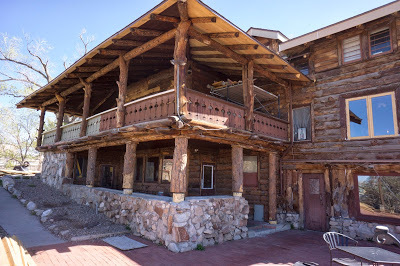 The posts just rotted away and as they rotted from the bottom the posts, and the porch above just kept dropping. 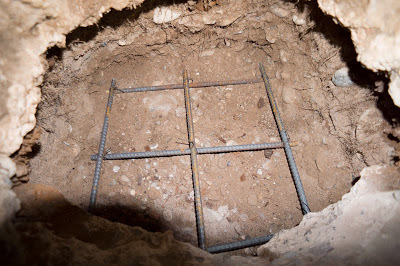 We excavated a footing 12" deep, 2' square, added rebar, then poured new footings. On top of the new concrete footings we install concrete columns. This short column is at the corner of the building. 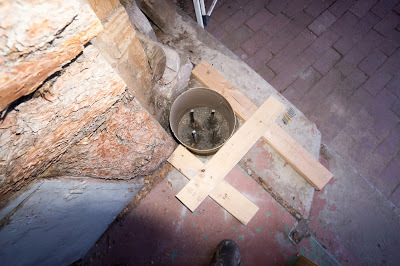 Notice the steel projecting into the column from the footing. This steel was installed when the footing was placed. Another of the concrete forms, preparing for properly supporting the posts. 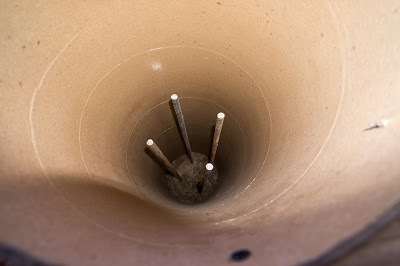 There is steel reinforcement in each of the columns. We are now prepared for placing concrete in the columns. this is the bottom of the log posted above. This was sitting earth, no concrete foundation. 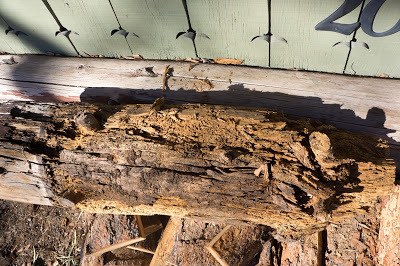 As the log rotted away from the bottom the log post slowly shrunk resulting in the porch above and the porch roof sinking. At the worst location the porch dropped more than 8". 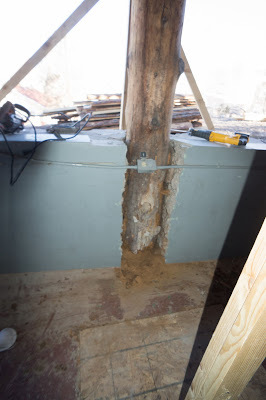 Here is the lower portion of one of the posts that supported the upper front porch and the porch roof. 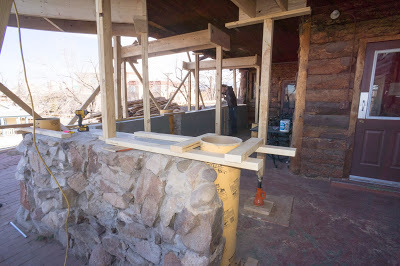 The lower portion of the log was enclosed within the stone wall of the lower porch (NorthWest off patio). 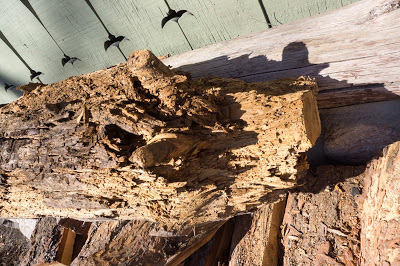 The portion of the log enclosed in the wall was just rotting away. 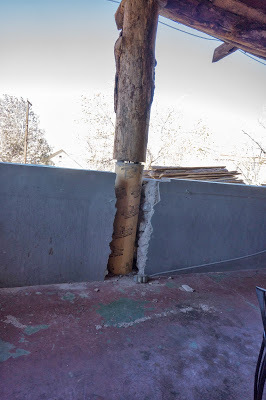 We need to trim out the tops of the concrete columns but, structurally we are golden.